Malt wine (grain distillate) is the basis of all true genever. Braeckman is one of the last remaining distillers who produce their own malt wine in-house. Braeckman malt wine is made exclusively from rye and malted barley, two indigenous grains. Malt wine adds a complex and rounded grain flavour to the genever. Alongside the malt wine, a herb distillate is added which contains juniper berries and a mixture of other herbs, seeds, peels and spices. This distillate gives the genever a pleasant and refreshing touch. Selected rye and malted barley are poured in hoppers. The grains are milled and water from Oudenaarde’s well is added – this is known as brewing water for the renowned Oudenaarde’s dark beers. The mash is heated and stirred constantly. This allows the malt enzymes to convert the starch into fermentable sugars. This process takes about 8 hours. This ‘wort’ is cooled and passed into fermentation tanks, or washbacks, where yeast is added. Fermentation takes at least three days. The yeast turns the sugars that are present in the wort into alcohol. During the fermentation our characteristic aroma is developing. Once the temperature of the fermentation decreases, an aromatic, fully fermented wash of 8% ABV remains, ready for distillation. After fermentation, the wash is distilled using a double distillation method. The fully fermented wash is heated with steam until it is boiling. 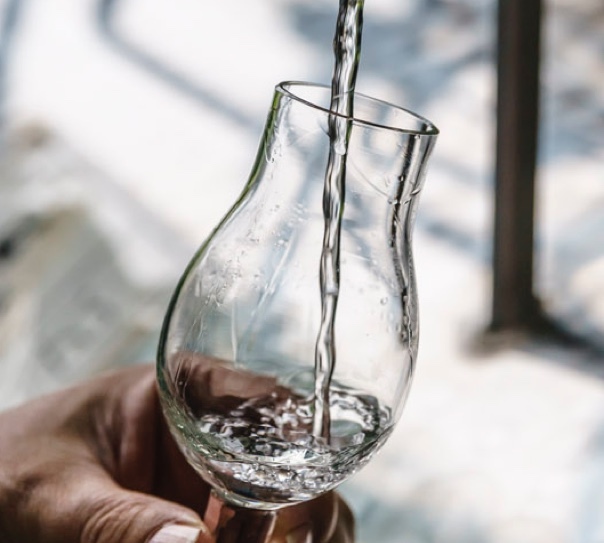 Because of the different boiling points of alcohol and water, some of the water is removed from the fermented alcoholic liquid. During this first distillation, the alcoholic vapours and the aromatic congeners are separated from the non-alcoholic liquid, called ‘the flush’, which is being discarded. Because distillation starts from an unfiltered wash, a lot of aromatic congeners of the grains will transfer into the distillate. The alcoholic vapours with the congeners are cooled and condense. The result is called raw alcohol or low wines. The raw alcohol of the first distillation is distilled for a second time in the copper pot still. Our master-distiller cuts the heart of the distillate from the heads and the tails. The pure, rich, and fruity heart of the distillate is collected. Because malt wine is distilled to a maximum ABV of 80%, it contains lots of flavour and aroma components from the raw materials, the fermentation, and the distillation. Malt wine can be used in pure and unaged form for the production of genever, but we also choose to mature some distillates. We use American oak barrels, formerly used for bourbon production, which add an oak aroma and hints of vanilla to our malt wine. The barrels are stored in our warehouse until the grain distillate has developed the right mild flavour, golden colour, and refined aroma specific to matured genever. The herbs are strictly selected by origin and quality. The herbs are carefully weighed according to the recipe and transferred to the herb basket. The pot still is charged with the herb basket, which is left to macerate for 24 to 48 hours in grain spirit. After maceration, distillation follows, which results in a flavourful herbal distillate.